The baby foot peel, a path to callous-free feet, is one of the strangest (and, frankly, most disgusting) paths we’ve encountered. We’re willing to put up with a lot in the name of callous-free feet, but soaking them in acid-filled booties in a bid to peel off the skin of the entire foot? Not something we’d ever considered until we heard about Baby Foot. The Japanese import promises such deep exfoliation that layers of dead tissue can sometimes fall off in sheets, leaving behind childlike, never-touched-the-earth smoothness. Contributor Kristin Booker agreed to treat her feet with kid, um, booties to tell you whether Baby Foot lives up to the hype. 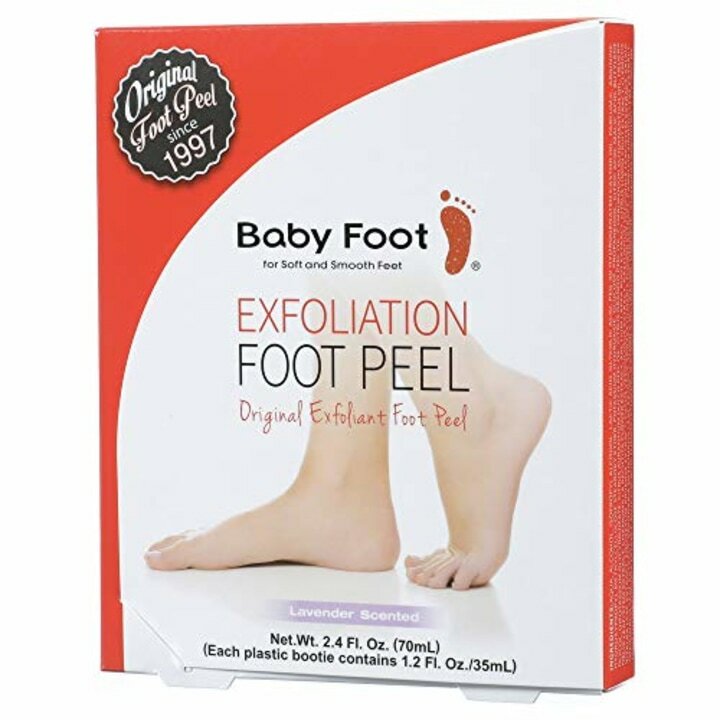 What is the Baby Foot peel? Essentially, it’s a boxed kit that contains a pair of plastic booties pre-filled with an exfoliating gel made from natural extracts and fruit acids. Over an hour-long soak, the gel seeps into the multiple layers of skin on your feet and dissolves the desmosomes (adhesive fibers) between those layers. Anywhere from a few days to a couple weeks post-treatment, the skin begins to peel off painlessly and naturally (albeit disgustingly), revealing the smooth, soft skin underneath. 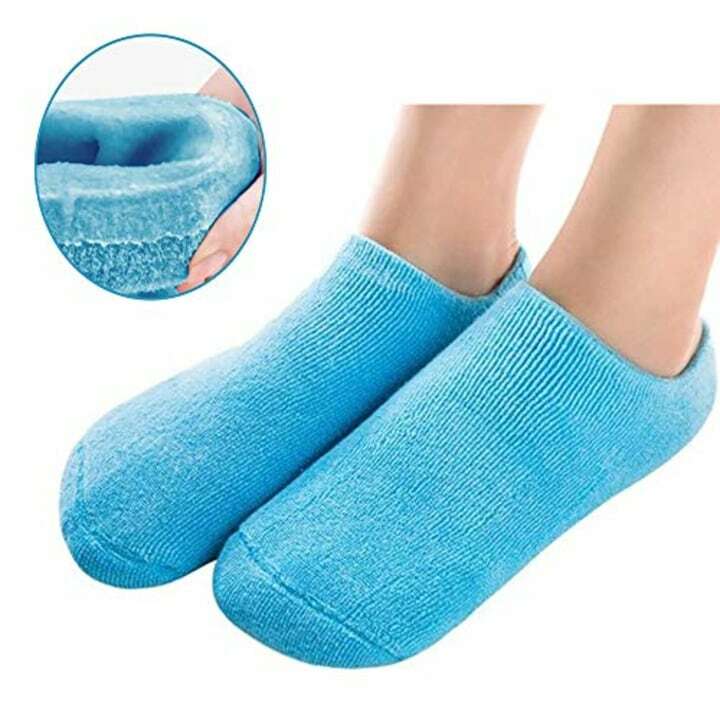 After removing toenail polish, you will wash and dry your feet and then slip them into the two provided plastic booties, which contain the fruit-acid solution. Kick back for an hour while the Baby Foot acids work their way into your calluses. This might feel a little tingly but shouldn’t burn or feel uncomfortable. Next, slip off the booties and rinse your feet. The rest is a waiting game until your feet begin to slough off cells days or weeks later. A one-treatment Baby Foot application kit is priced at $30, but is on Amazon Prime right now for $24 and free shipping. Also available for $19 at Walmart, for $25 at Bed Bath & Beyond and Target and in a two pack for $40 on Amazon. I’m someone who apologizes profusely when I sit down for a pedicure. I live in Manhattan, and excessive walking creates a build-up of dead skin that leaves my feet looking like I’ve been hiking through Middle Earth. Needless to say, I was really excited to try this product and see if it lived up to expectations. When I cracked open the odd, space-age plastic booties filled with gel, my first thought was, “How am I going to position my feet?” I like to kick them up to work or watch TV, and fluid-filled socklets are not conducive to that behavior. Eventually, I stuck in my feet, taped them in place and for the next hour sat with my soles flat on my rug, hoping to feel the magic happen. The only thing I sensed was a cool wetness and almost imperceptible tingling. A quick note of caution: Before you put the booties on, make sure you have whatever you need at the ready. Baby Foot boots are not made for walking; they’re very slippery and, well, not actually footwear. After an hour, I removed the booties, washed my feet and went on about my business. I saw absolutely no change until about four days later, when areas at the back of my heel and underneath my big toes began to flake. A full week down the road, and my feet were peeling like crazy. Whole sheets of skin came off in one go. I tried to remove them at home with a trash can nearby, but let’s say that I was vacuuming a bit more than usual since my rugs were sprinkled with little souvenirs from my beauty adventure. The result? Incredible. Into week two, the skin on my feet was pink, perfect and glowing. I also learned that because this new skin had never known the rigors of my prior walking routine (“30 blocks? It’s faster just to walk!”), I had to go easy on them. I would advise skipping shoes that rub for a few weeks after exfoliation: If you’re like me, you’ll want to keep your feet in pristine condition. I’ll probably do a treatment about once every two to three months to keep my feet soft (and to reduce the pedicure shame I feel when hitting the salon). Considering that Baby Foot has stretched my time between pedicures, it’s saving me money. After all, heavy-duty exfoliation is usually best left to the experts, but with consistently-smooth feet, I can handle the polish change at home. Viva la Baby Foot! I love this product! If you aren't committed to the whole idea of a week-long peel, here are some other tools that are highly rated on Amazon for removing calluses. 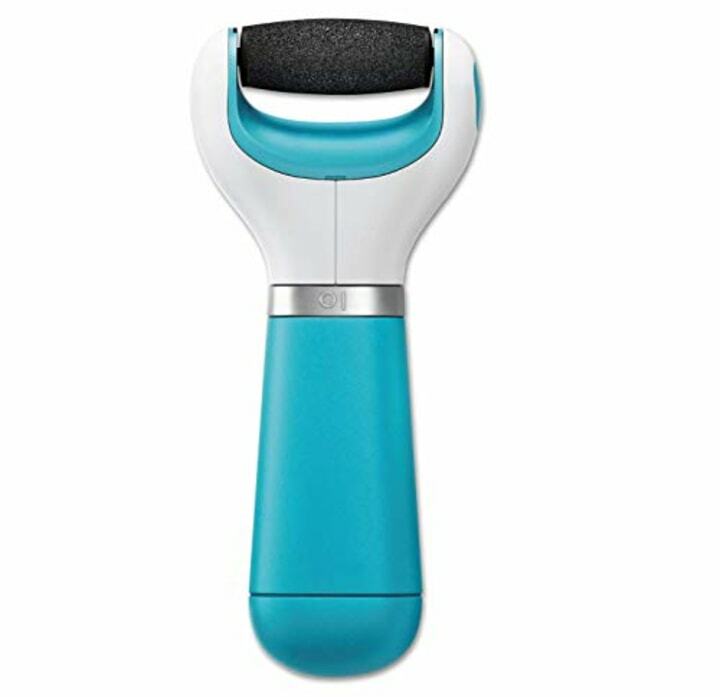 This electronic foot file claims to easily buff off hard calloused skin for a luxurious at home pedicure. 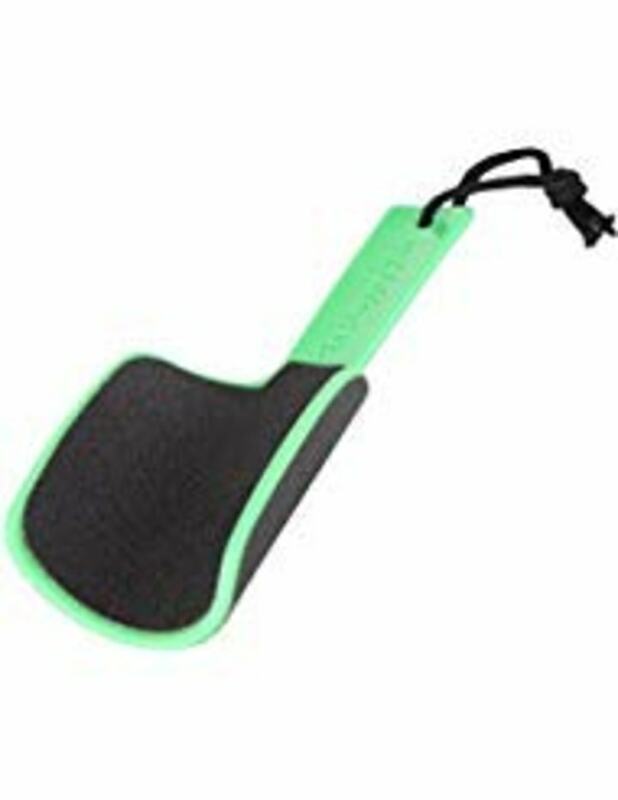 With two surfaces, one to slough off rough skin and one to buff the soles of your feet, this washable foot file is really an all-in-one solution. These are the ultimate multitasking product — your feet soften as you do other things, no need to spend time working away at the callouses. Follow Kristin Booker on Twitter and Google+. This story was originally published July 24, 2013 on TODAY.com.